You can witness the collisions of the new crashing into the old in the Metropolitan Museum’s joyous show, Impressionism, Fashion, and Modernity. 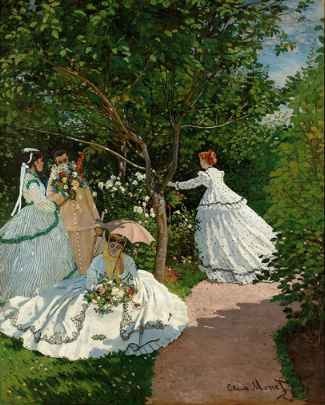 Impressionism’s heaviest hitters (Manet, Monet, Renoir, Cassatt, and Morisot) are displayed alongside stunning 19th Century dresses, suits, accessories, and underthings to prove a point — that incorporating the latest fashions was one of the cudgels that these rule-breakers used to facilitate their revolution in painting. The show features paintings from three grand Impressionist collections (the Met, the Art Institute of Chicago, and the Musée d’Orsay), and includes breathtaking dresses from NYC’s fashion-collection superpowers – the Met, the Brooklyn Museum, FIT, and Museum of the City of New York. The Met’s website explains the key themes of the show, but it’s no substitute for going through the galleries in person. Why? The tiny photos cannot do justice to the monumentality of these paintings, where scandalous 19th-century fashionistas stormed the barricades of the French Salon, in large-format framed paintings normally reserved for staid, moralistic history paintings. The show’s curators shine the spotlight on how fashion, innovation, and the art world influenced one another: New aniline dyes allowed hot pink, bold color-blocking and vivid hues for extravagant skirts and dressing gowns. New fabric-finishing technology enabled super-white cotton fabric to be crafted into diaphanous, desirable, but high-maintenance dresses and gowns for the first time in fashion history. 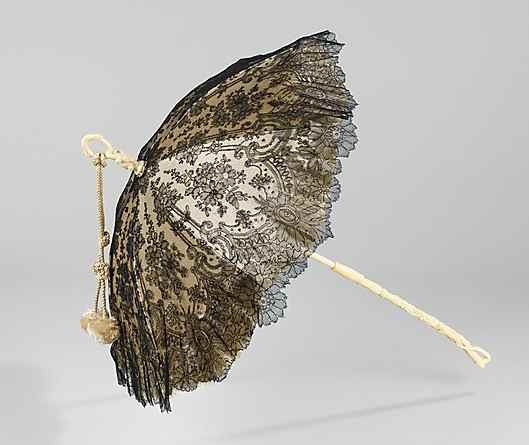 The Met scatters mass media throughout the galleries, just to demonstrate fashion’s democratization during 1850-1890. New printing technology enabled trendy fashion magazines to be consumed by the masses. New-fangled duplication techniques revolutionized the studio photograph by inventing the eight-image carte-de-visite – a paper-based way to market your “celebrity” self and show off your fashion chops long 150 years before Facebook and YouTube. Pop-art pink velvet, boleros with pompoms, lace parasols, Worth gowns, kid gloves, top hats, corsets, hat shop girls, high-end boutiques, and Cezanne’s surprising oil painting based on a fashion-magazine layout. Which part of this show is the best? Go before May 29, when the show decamps for Chicago for its June 26 opening. This entry was posted in Art, Fashion, History, Museums, Technology and tagged art, culture, design, fashion, history, museums, painting, style, textiles by mssusanb. Bookmark the permalink.